On a Sunday afternoon the taco enthusiast might feel daunted by having to choose just one place to eat lunch, but today Carmen and I decided correctly to go to Chulada Grill. Sharing the smallest of corner strip malls with a cleaners and a launderette, Chulada is inconspicuous at the unprominent intersection of San Vicente and Hauser, but it’s also exactly the kind of neighborhood Mexican restaurant that you should know about, and even drive a long way to get to. 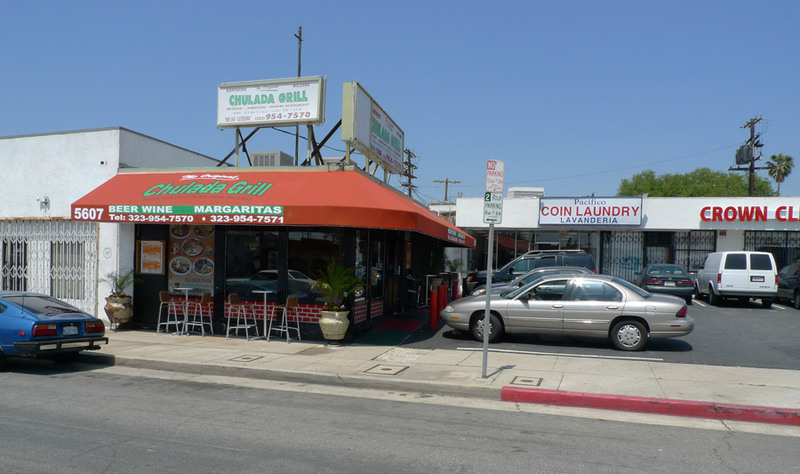 Small and cozy inside with only about ten tables, Chulada Grill’s specialty is serving you food. They take quality seriously, offering handmade tortillas for their tacos and tortilla chips fried fresh (no longer gratis but you should still consider ordering a bowl), and a bottle of XXXtra hot-as-the-sun El Yucateco hot sauce on each table. I ate dozens of delicious machaca burritos here between 2005 and 2007. Besides tacos and the many burrito options, their menu includes Oaxacan specialty plates. Today their stereo played several songs by the Smiths, which choice I would like to think was inspired by my appearance. Soft tacos are $2.75 each, not inexpensive, but the quality justifies the price. I ordered one each of the carne asada, carnitas, and al pastor tacos. Look at those big cuboid chunks of carnitas – that’s what Carmen and I did when the tacos came out, and then obligingly each ate this taco first. This was the best carnitas I have enjoyed this year. Still hot and fresh out of the fryer, it had a genuine crispiness to it, reminiscent of the crispy fried pork you might get at a Thai or Cantonese restaurant. Each piece was crisp on the outside and moist on the inside – biting into a piece cracks it open to reveal juicy, full-flavored porkiness contained within. The appearance is fantastic. The cubes of pork look exactly like diced animal flesh, exhibiting in section a range of color and fattiness from one edge to the other. The richness of flavor was undoubtedly porky, and yet Carmen’s observation that it tasted like Popeye’s fried chicken was accurate – the carnitas had the same butterfatty quality that great fried chicken provides. The carnitas taco was so good that Carmen ordered another one after we had cleaned our plates. The fine handmade tortillas didn’t hurt, either. They are thick and bubbly, leathery, with mild corniness and great resilience. Next I ate carne asada. It hit the spot, providing exactly what a carne asada fan would be seeking in a taco – the steak charry and subtly flavored so that the buttery-fatty beef flavor comes through most strongly. It seemed as if the rojo provided on this taco was hotter than that supplied with the others, which if true reflects well on the taquero’s commitment to taco curating. 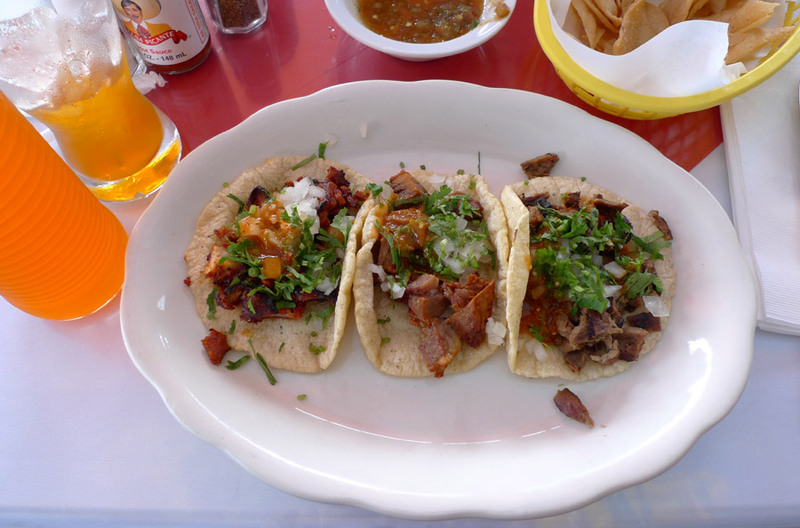 The al pastor also proved to be a high-performing taco. The pork was dryish and dry rubby, lubricated by salsa, generated an experience of contrast between moisture-sucking dryrubbiness and dryness-drenching salsa roja. The bite is met with good al-dente tooth feel, and preceding the marinated pork taste was the dominant cinnamon flavor of the spice rub. I was left wanting more. Still am. What’s for dinner?